Celebrate 20 years of Power Rangers! Amazing die-cast metal prop replica of the Green Ranger's Dragon Dagger. Includes awesome sounds from the original TV series! Celebrate 20 years of the Power Rangers TV series! From the hit original Mighty Morphin Power Rangers comes this incredible prop replica. 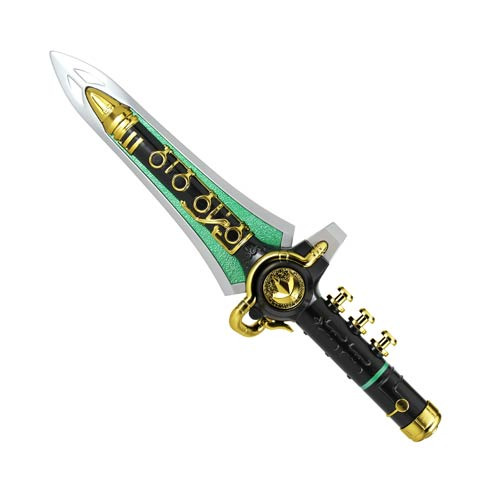 The Power Rangers Green Ranger Dragon Dagger Die-Cast Metal Talking Prop Replica from the original Mighty Morphin Power Rangers is made partly of die-cast metal material and features sounds from the original series. Dagger measures about 16-inches long. Ages 15 and up. Power Rangers Dragon Dagger + Flute = Fun!